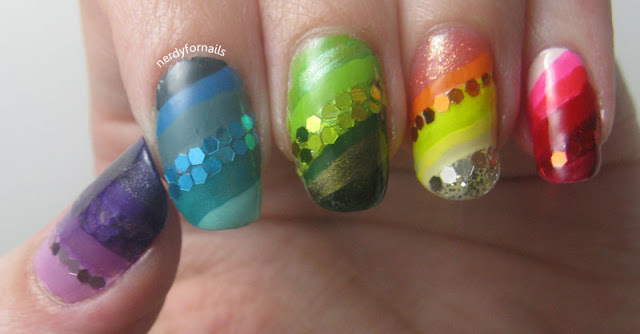 Can rainbows be a favorite nail art technique? I've been obsessed with chromatic groupings of colors ever since I got a Rainbow Bright book as a kid. I was mesmerized by all the red things on one page and all orange on the next. That's just the way colors should be right? One tragic day that book fell between the slats in the porch deck never to be seen again (well, at least not until several years later when the siding finally got rickety enough for me to pull apart a gap wide enough to squeeze through and rescue my now water damaged and moldy book). To this day I still arrange everything in my closet by color. Ok, so maybe rainbows aren't, in fact, a nail art technique. I'll go for hand painted then. There's something satisfying about painting freehand. 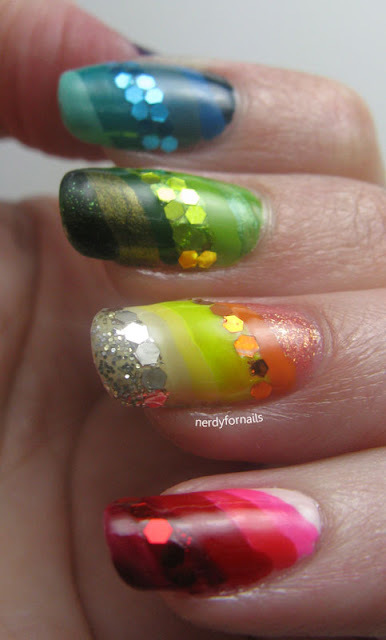 Even though the lines are a bit crooked I still feel a sense of accomplishment I just don't get from striping tape or stamping. 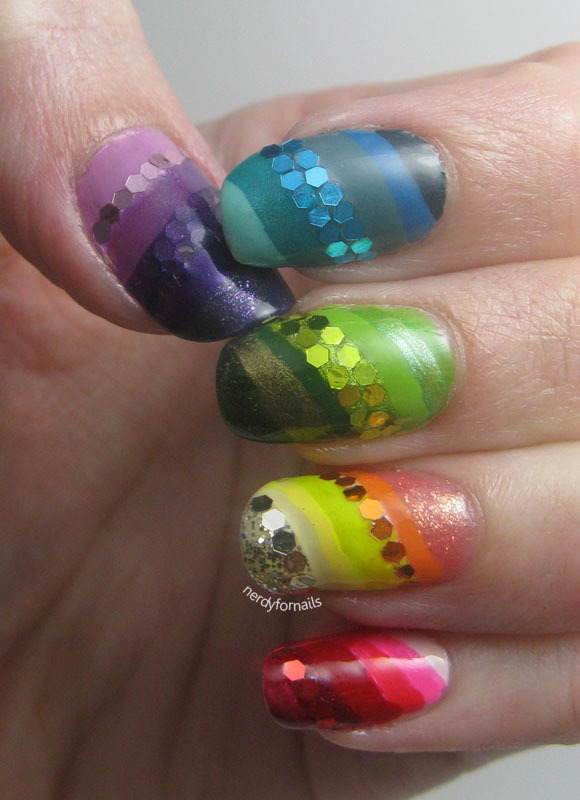 All stripes were painted with a nail art brush or the brush that comes in the bottle. Colors used (I think this may be my all time record): 30 plus base and top coat. 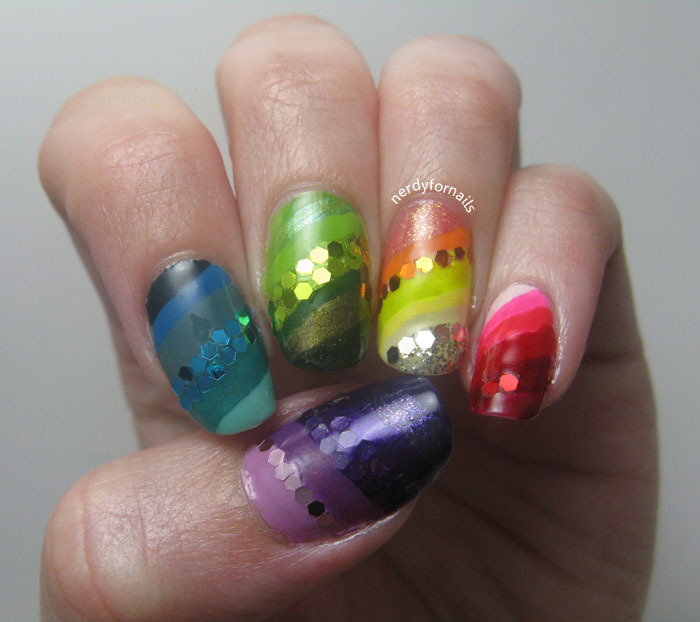 I also stuck in a few glequins from Born Pretty for extra sparkle. Here we go- thumb to pinkie, base to tip. Spoiled, Did I Dye It Too Blonde? Erin! You have seriously outdone yourself. This is super gorgeous! Thanks! I didn't love it at first, but its grown on me. I couldn't decide which finger was my favorite. By the way, color grouping your closet is a really handy and smart thing to do! !